Generation V Welding Positioner | Team Industries | TEAM Industries Inc.
Hydraulically actuated system provides trouble-free, smooth height adjustment. A redundant drive system with two gearboxes controlling the load. This will enhance the safety of the positioner by reducing the load on any single drive component as well as allowing for a secondary means of controlling the load should damage occur to one of the gearboxes or other drive components. A redundant drive system with two planetary gearboxes moving the load. 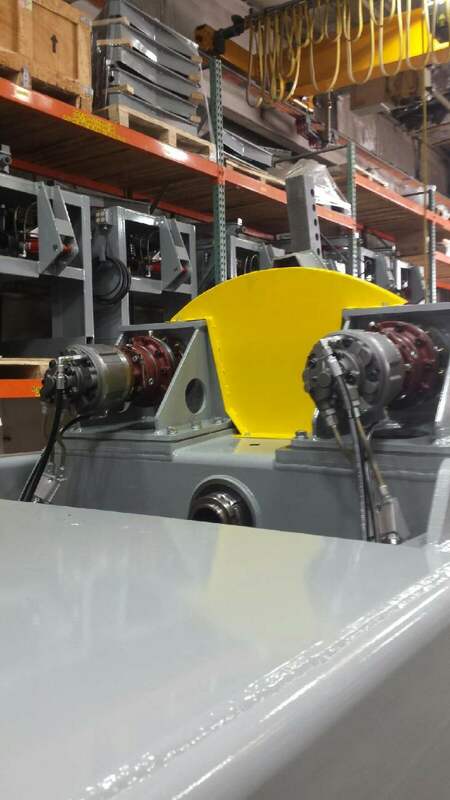 This will enhance the efficiency of the positioner by reducing mechanical inefficiencies. A hydraulic pump unit with increased capacity. This will allow for faster cycle times of the raise / lower and tilt forward / tilt backward functions. A wireless hand control system will complement the wireless foot control. This will allow the operator to have a full range of positioner controls without having extra cords that clutter up the work area. All normal functions will be immediately available to the operator without the need for extra hardwiring or programming. The unit will be able to change from a hand welding workstation, to a sub arc workstation, to a plasma cutting workstation, to a pipe fitting workstation with no extra set up time for the controls.